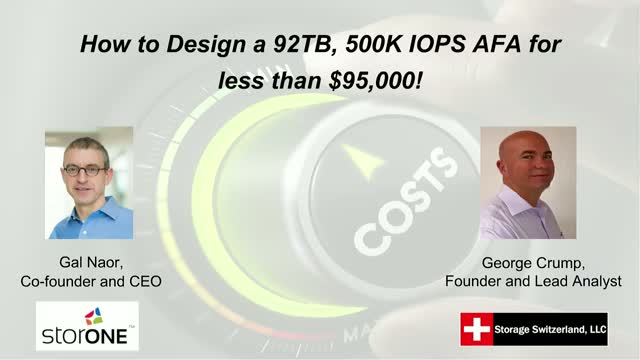 How to Design a 92TB, 500K IOPS AFA for less than $95,000! In this webinar we will discuss why their software bottlenecks current all-flash arrays. We will explain how inefficient storage software requires vendors to use more powerful and more expensive CPUs, as well as a greater quantity of flash drives. We'll also explain why technology advancements like NVMe and increasing flash density will only make the situation worse. Registrants for the webinar will receive a copy of Storage Switzerland's eBook "Why Does Storage Cost So Much - How to Dramatically Lower the Cost of Storage". Title: How to Design a 92TB, 500K IOPS AFA for less than $95,000!